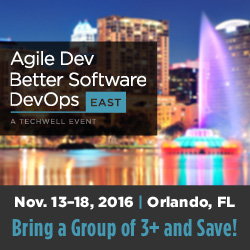 Agile Dev, Better Software, & DevOps East will be held November 13–18, 2016, at the Hilton Orlando Lake Buena Vista. The collocated conferences offer access to more than one hundred learning and networking sessions over six days. Attendees can take part in training and certification courses, half- and full-day tutorials, topical concurrent sessions, and a variety of networking events. “The benefit of three conferences in one location is that attendees will have access to content covering the full spectrum of software engineering–allowing them flexibility to customize their program,” said Stasi Richmond, director of marketing for TechWell. Agile Dev, Better Software, & DevOps East enhance the learning experience by offering deep dives into leadership, project management, and processes as well as the latest agile and DevOps techniques and topics. Pre–conference training classes offer certifications and continuing education credits from bodies such as ICAgile, PMI, ScrumAlliance, and the ISTQB®. Keynote presentations, such as Lead Teams that Deliver the Goods, Building Product Development Communities: From Startups to the Enterprise, Solve Everyday IT Problems with DevOps, and Agile Metrics: Make Better Decisions with Data, offer compelling and timely topics. The in-depth full- and half-day tutorials are consistently the most popular learning sessions and hour long concurrent sessions offer topical discussions on specifics such as agile leadership, agile techniques, agile and DevOps implementation, project and and teams, test and QA, business analysis and requirements, and more. Participants in Friday’s Agile Leadership Summit will collaborate with experienced agile leaders that have led lasting change and produced thriving agile cultures. This full–day event explores ways to challenge personal leadership growth and lead in your organizational challenges including communication interpretation, anti-fragile approaches, visual data information radiators, and more. For more information and to access the full conference program, visit https://bsceast.techwell.com. TechWell—through its conferences, training, consulting, community websites, and online resources—helps people and organizations develop and deliver great software. For more information, visit https://www.techwell.com.